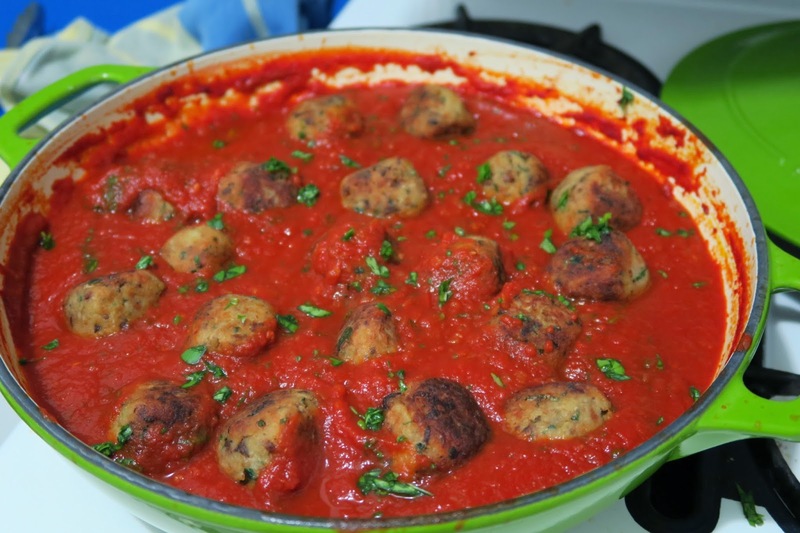 Eggplant and Porcini meatless 'meatballs' with tomato sauce. The recipe I made last Tuesday is probably the evil twin sister of the previous recipe I posted. Lets just say there is more to it than throw it all together and bung it in the oven. This one is a labor of love. Sometimes I really enjoy pottering around in the kitchen. Stirring a sauce here, doing a little frying there, while something is cooking away in the oven. It's like when you cook risotto, there is always pottering around the kitchen. A little stirring then another ladleful of stock and maybe roasting some vine tomatoes or making a pesto to stir through. Now it's not to say I haven't had some disasters over the years when I think it's all going to plan but end up eating at 10:30 (one time 11...eeekk) at night and being so sweaty and past hungry I feel like a train wreck. Not to mention the kitchen looks even more like a train wreck than I do. I have found the trick is not to get flustered. Yeh yeh easier said than done but if I keep my cool and just potter it's usually quite satisfying, a tastier dinner and I don't end up feeling like a train wreck at the end. 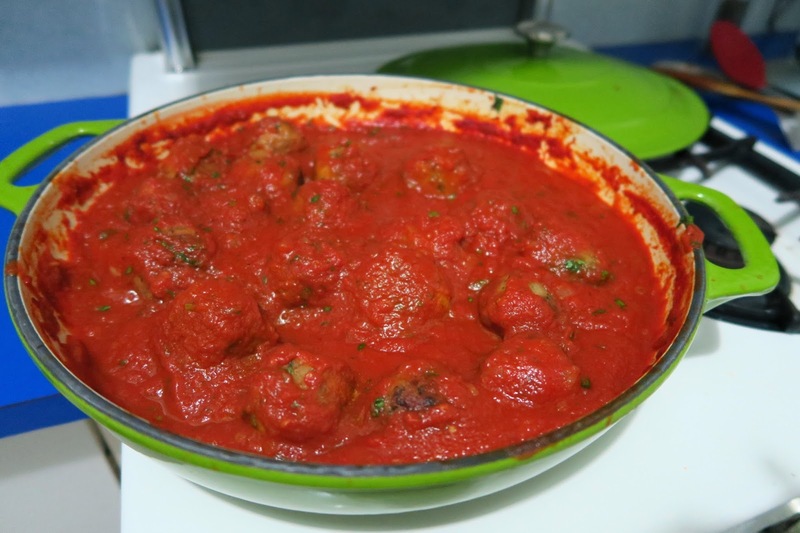 These Eggplant and Porcini meatless 'meatballs' with tomato sauce were such a success and an absolutely delicious one at that! They are definitely a labor of love and not a quick mid week meal but in saying that if you get home from work earlier then I do why not spoil yourself during the week and put in a little extra effort? I got the recipe from blogger Amelia Morris from Bon Appetempt who found it in a magazine called Food and Wine. It's actually the first post I read from her blog. The link was part of The Wednesday Chef's Saturday links post back in October last year and I've been a huge fan ever since (I even went back and read most of her old blog posts...). 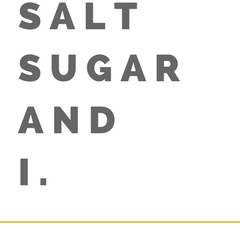 If your a regular reader you've probably heard of me going on about her blog and her cooking show on youtube so I'll stop my ramble and just link everything here (you really should check her out!). This dinner was actually incredible. 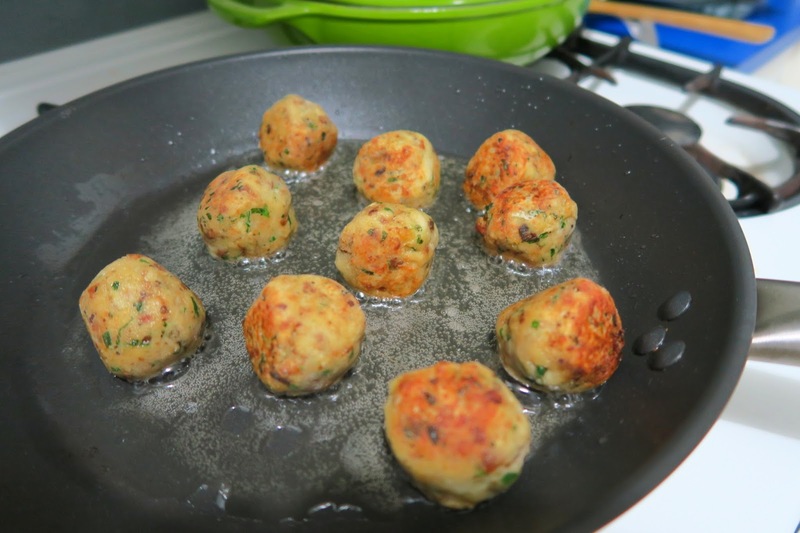 I am still thinking about them a week later and not only did I thoroughly enjoy myself pottering around the kitchen and rolling garlicky eggplant balls but the taste was incredible. You get the robust flavours from the dried porcini mushrooms and garlic that work so well with the silky eggplant. 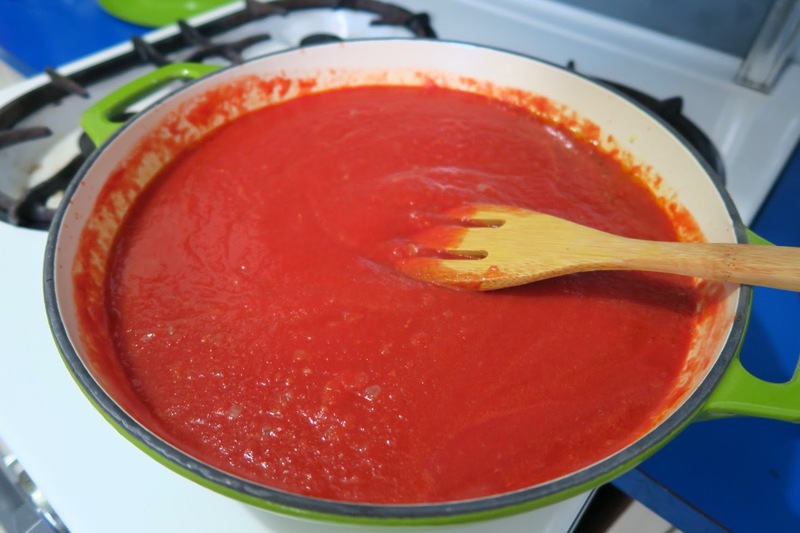 Oh and the tomato sauce uses the porcini soaking water in it which turns it into a turbo tomato sauce that is packed with flavour. I loved this recipe and will be making it again for sure! 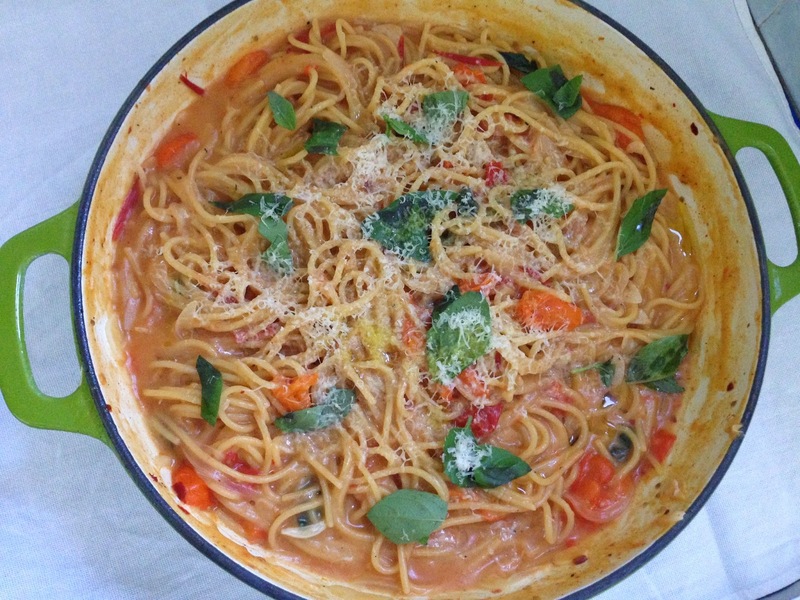 I served it with crusty bread but it would work perfect with pasta too or even polenta. Show a little labor of love this week or weekend and cook these for dinner... it's well worth it! Please note I have converted the recipe into metric measurements so they vary slightly from the original. - Preheat your oven to 350F or 180C. 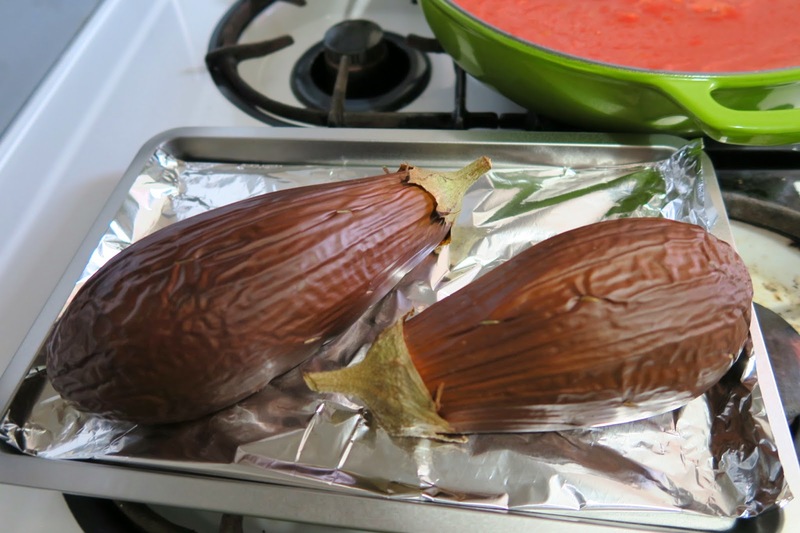 - Prick your eggplant(s) all over with a fork and place on a baking tray. Roast in the centre of the oven for 1 hour, until very soft and collapsed. Let the eggplant cool slightly, then scrape the eggplant flesh into a bowl and let cool completely. Discard the skin (I was impatient so I stuck my hot eggplant flesh in the freezer for 15 min to cool down). - Meanwhile, in a heatproof bowl, cover the porcini with 1.5 cups of boiling water and let stand until softened, about 30 minutes. Drain but reserve the soaking liquid. Rinse the porcini to remove any grit and extra dirt then finely chop the porcini. 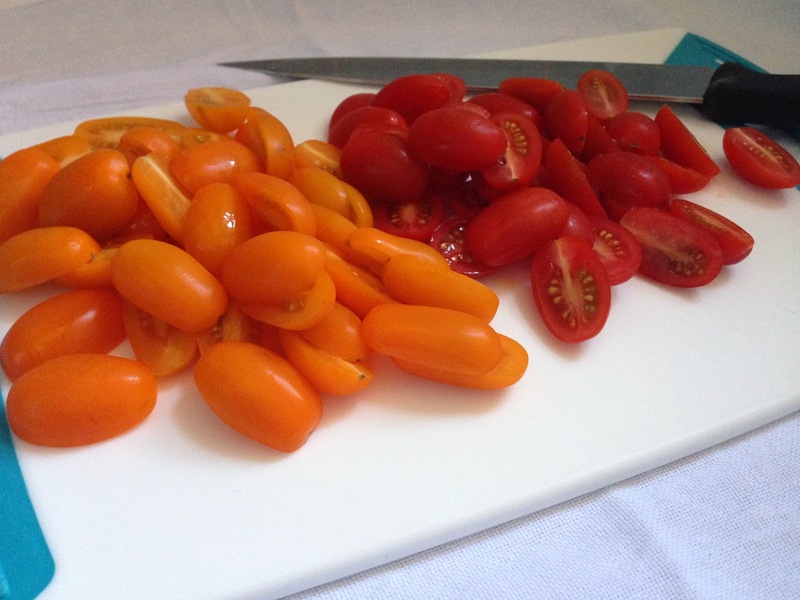 - In a large casserole pot heat olive oil until shimmering. Add the onion and half the garlic and cook on medium heat, stirring, until softened for about 5 minutes. Add the tomato puree (or passata) and pour in the porcini soak liquid but stopping before reaching the grit at the bottom of the bowl. Bring it to a boil and then simmer on low heat until thickened, about 1 hour. Add half the chopped basil and season with salt and pepper. - In a medium sized bowl mix together the chopped porcini, bread crumbs, eggs, cheese, parsley, remaining garlic, eggplant flesh with 1 teaspoon of course salt and 1/2 teaspoon of freshly ground pepper. - Line a baking tray with baking paper. Form the eggplant mixture into 20 balls (about 1 3/4 inches), rolling tightly. 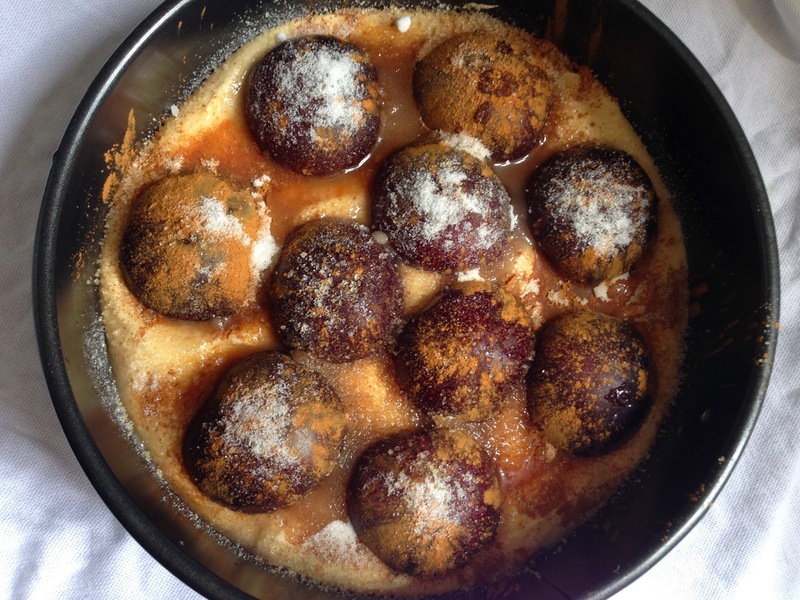 Dust the balls with plain flour and refrigerate for 20 minutes. - In a non stick frying pan heat 1 cm deep of vegetable oil. Add half of the eggplant balls at a time and cook over medium to high heat, turning occasionally, until browned all over, about 8 minutes. Drain on paper towel. 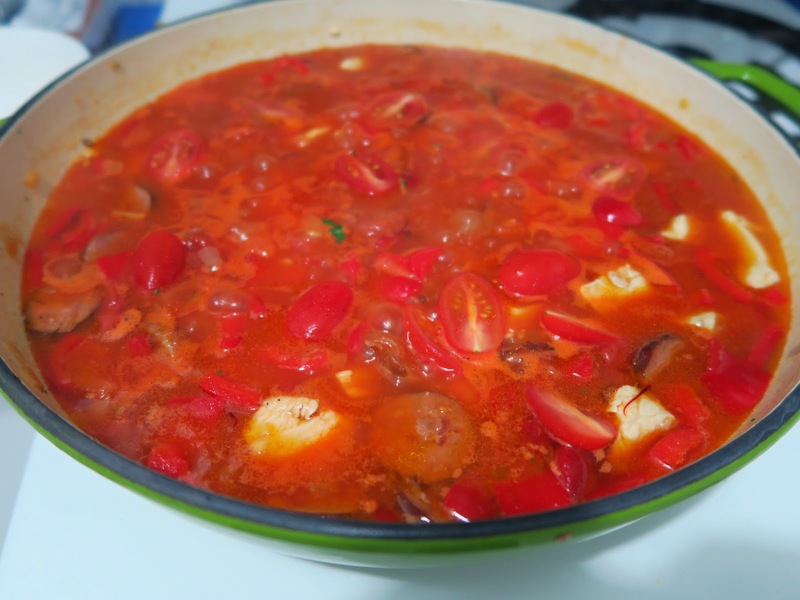 Add the eggplant balls to the tomato sauce and simmer for 5 minutes. 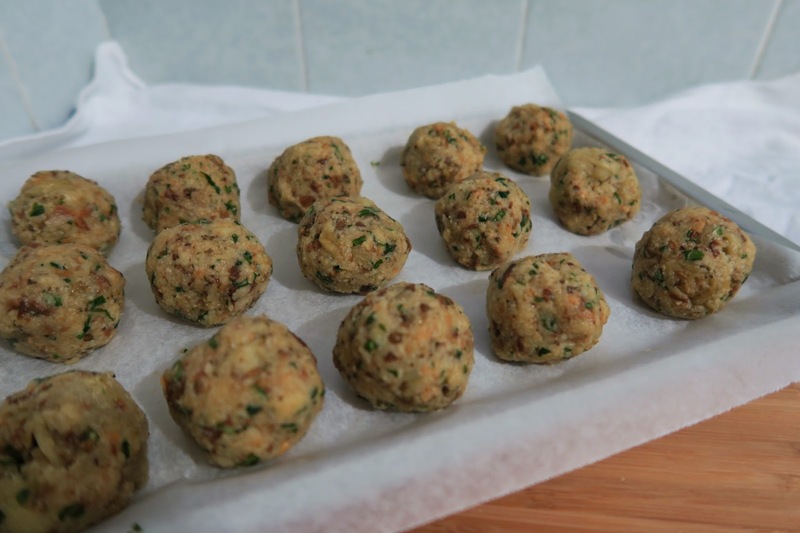 Garnish the meatballs with basil leaves and serve with extra grated cheese and crusty bread. 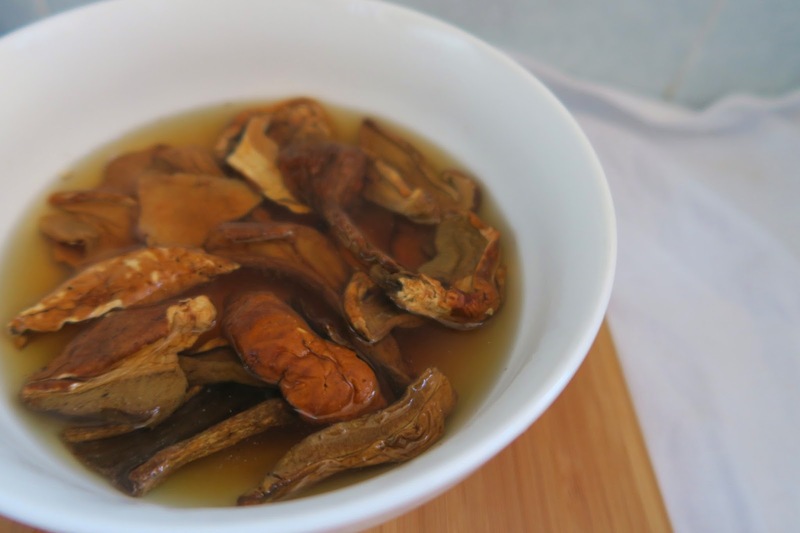 ** I got the dried porcini mushrooms from Essential Ingredient online. Hit 'n' Run traybaked chicken. Chicken tray bakes. For a while I thought these would be the end of me but I have gotten to know my oven inside and out and I know what works and what doesn't. Chicken tray bakes are easy mid week meals (note that this is a new revelation) which you can easily throw in the oven and then fluff around for an hour while the oven looks after everything. I love these kind of recipes where I can multi-task while knowing dinner is cooking away and I can get on with other things. If you're a regular reader you'll know I'm more of a pasta girl than chicken and potatoes kinda girl. Now don't get me wrong, I do enjoy chicken and potatoes but give me a big bowl of pasta any day! Tristan on the other hand LOVES chicken and potatoes. I could spend hours making hand made pasta with a slow cooked ragu and ciabbatta made from scratch but chicken and potatoes would still win. Of course he would enjoy the hand made pasta and tell me that he loved it but I know all too well when he actually loves eating something... it's like when you're a kid and you get your favourite food and the excitement beams out as you try and shovel another mouthful in an already full mouth. That's Tristan, when I serve chicken and potatoes. The way to his heart is chicken and potatoes. So of course I made a chicken tray bake this week. Sometimes it's what ever I can find in the fridge but this week I found a recipe called Hit 'n' Run traybaked chicken by Jamie Oliver from his cookbook Save with Jamie. It sounded perfect to me until I realised when I started throwing everything into the tray that there was no potatoes in it... uh oh I thought... do we even have any potatoes? 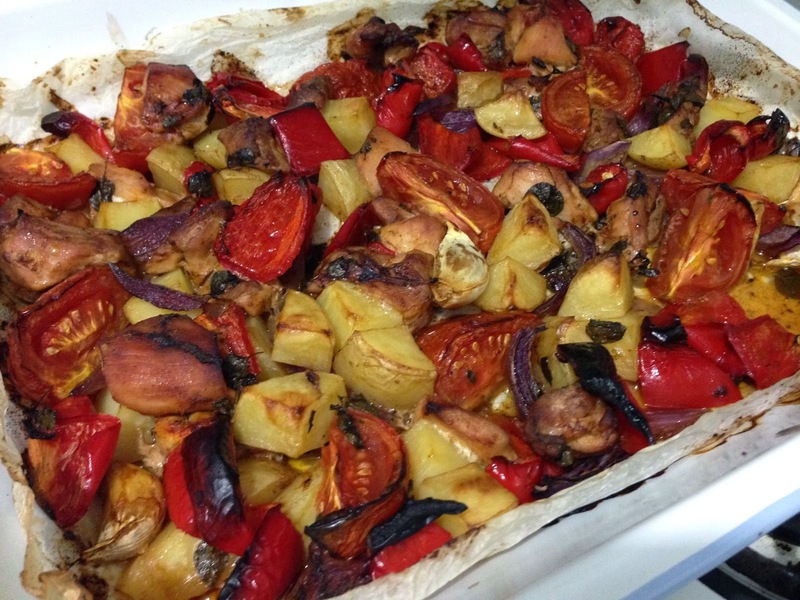 Thankfully there were three potatoes floating around with the onions so I chopped them up small and added them to the tray with the chicken, tomatoes, onion, garlic, capsicum with the rest of the ingredients and threw it all in the oven. Ah ha done for an hour or so! This recipe is really really tasty, I'll admit it's another recipe thats not going to win the pretty award but by golly it's good. The garlic cloves go all soft and sweet and the tomatoes almost slow roast and all the natural sugars come out and give the whole dish that humble slow roast taste. - Preheat your oven to 200C or 400 F.
- Throw everything (yes everything!) in a large baking tray (roughly 25cm x 30cm) and give it a good mix. Make sure it is all evenly spread out then bung it in the oven. - Bake for 1 hour - 1hour 15 min. 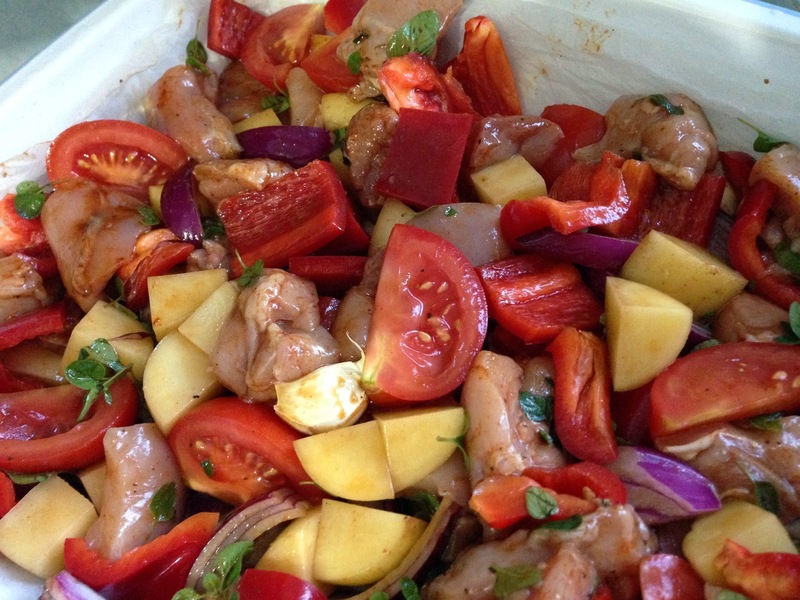 Check your potatoes and chicken are cooked through then serve with a simple green salad or some crusty fresh bread. chorizo, chicken and seafood paella inspired by Jamie Oliver. I'm a romantic so I'm all for Valentines day. Now lets not get carried away though… My perfect Valentines day starts with avoiding all restaurants and cafes the entire day. Breakfast at home, a good coffee then ok maybe a single ruby red rose always makes me feel a little special :) Dinner is the same… avoid avoid avoid restaurants at all costs!! Staying in for the night was clearly the only sane option and if we didn't want to wait hours for take-away to be delivered cooking was also the only sane option. I wanted to make something a little bit special so decided on paella with smoked chorizo, chicken and fresh seafood. I would have loved some mussels or pippis to go in it but our fish shop didn't have any so we decided on king prawns, squid and a few scallops. Dessert was a no brainer. I know it's one of Tristan's favourites and I'm going to say it's probably my favourite dessert too. Creme Caramel. Every time I make this I am reminded why I love it so much… silky custard nested in a pool of caramel sauce flecked with vanilla bean… UM YUM! Plus they are really easy to make, don't require any heavy mixers and often the ingredients are always on hand (milk, sugar, eggs and vanilla) which makes them even better. I unfortunately didn't take any photos of the creme caramels this time around but I used the same recipe as last time. I used 4 slightly bigger ramekins this time and they took about 50 minutes to cook. This meant that we got to have them again the next night :) double win! 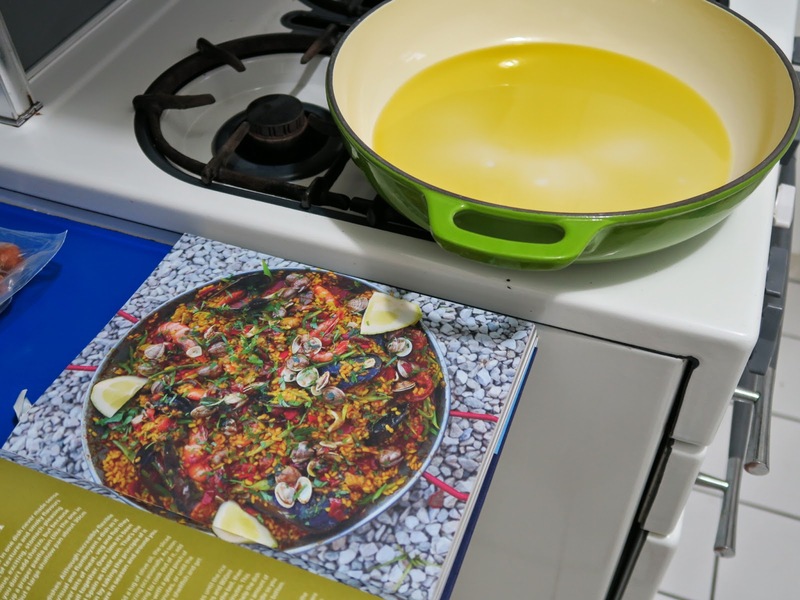 The paella recipe I used was from Jamie Oliver's book Jamie Does. I tweaked it a little bit to make it feed two but this easily fed 4 (we had leftovers for lunch the next day) and because I didn't have all the ingredients - my planning wasn't so great but I don't think it mattered. It was so fresh and full of flavours, I can't wait to make it again and add mussels or pippis to it. The great thing about this recipe is that if you don't like all the seafood or can't get your hands on it you can easily substitute it for something you do like or if you're a total seafood hater leave it out altogether and add a little extra pork or chicken. If you're looking for a recipe to impress or something a little special then this is a keeper and I recommend making the creme caramels for dessert too. They are a really great make-ahead dessert because once they're baked all you need to do it chill them in the fridge for 4 hours (you can even make them the day before) and flip them out onto a plate to serve. chorizo, chicken and seafood paella. - Heat olive oil in a heavy based frying pan (or paella pan if you have one) and add the chorizo and chicken. Fry for about 5 minutes on medium heat until the fat starts to come out of the chorizo and the oil starts to take on the chorizo colour. - Add the capsicum, onion, garlic, parsley stalks, saffron and some salt and pepper. Fry that for a further 5-10 minutes until the vegetables soften. - Add the rice and jarred capsicum and stir for a couple of minutes until the rice is coated in all the juices. Add the can of tomatoes and stock and bring everything to a boil. Turn the heat down to low and keep at a simmer. - After about 15 minutes the rice should be cooked but still have a but of a bite to it. Add your prawns, scallops, mussels/pippis and calamari tubes and give it a stir. Cook until the mussels/pippis start to open and the prawns turn pink. Add the frozen peas and cook for a further 5 minutes or so. - Any mussels or pippis that haven't opened, discard now. - Stir through the parsley and juice from half a lemon. - Serve with lemon wedges and extra parsley on top. Last Sunday.. not the one just passed.. the previous one. I started assembling a new bedside table. I started strong even if Arthur was against me the entire time and had an aversion to this new piece of furniture. 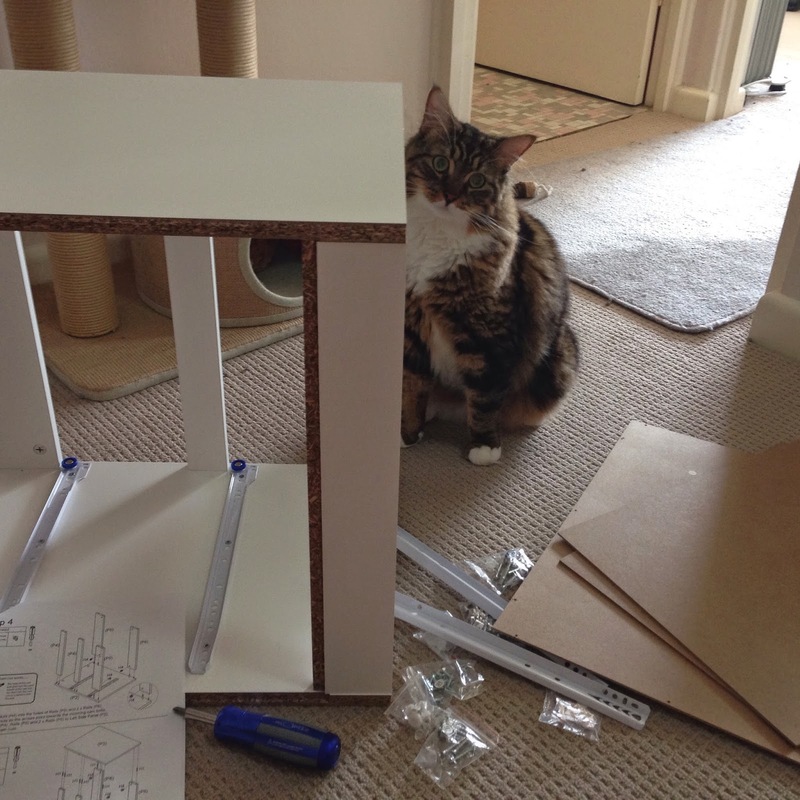 He sat on the pieces I needed next, attempted to chew the corners, decided that the screws were his latest toy and when I went to screw a new screw in... that was his time to attack my hand/screwdriver. But even with Arthur against me and procrastination looming heavy in the background in the form of youtube videos or online shopping I pursued! Arthur and I did have another altercation or two when he insisted the frame of the bed side table was his new cubby house and the assembled draws were his new bed. Although I did have a momentary lapse and decided to make the famous Plum Torte from the New York Times in between draw one and two. It was only fair to have a break right? I was nearly done anyway. 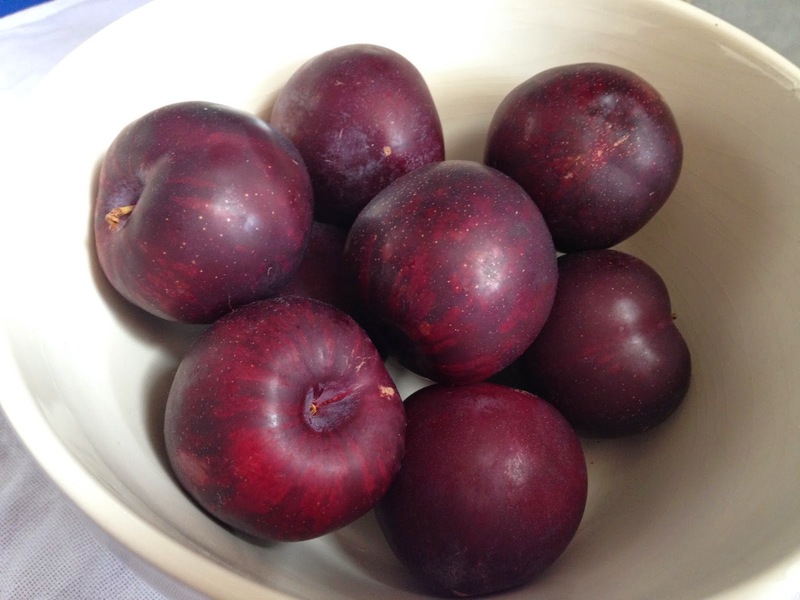 Plus I said I would bring dessert to dinner at Tristan's parents and I couldn't go empty handed... actually I have wanted to make this recipe for a while now and it just so happened to be that plums were in season and on special at the supermarket. The original Plum Torte recipe by Marian Burros featured in the New York Times every September from 1983 for 12 years. I first read about this recipe in one of my favourite memoirs I always talk about 'My Berlin Kitchen' by Luisa Weiss (The Wednesday Chef) but she didn't seem too enthusiastic about it. Since then I've read a few other blog posts about it and (Smitten Kitchen is a gooden) and they seemed to rave about it. Then I saw these photo's on Bon Appetempt by Amelia Morris and I couldn't not make this when plums were in season, it looks beautiful! 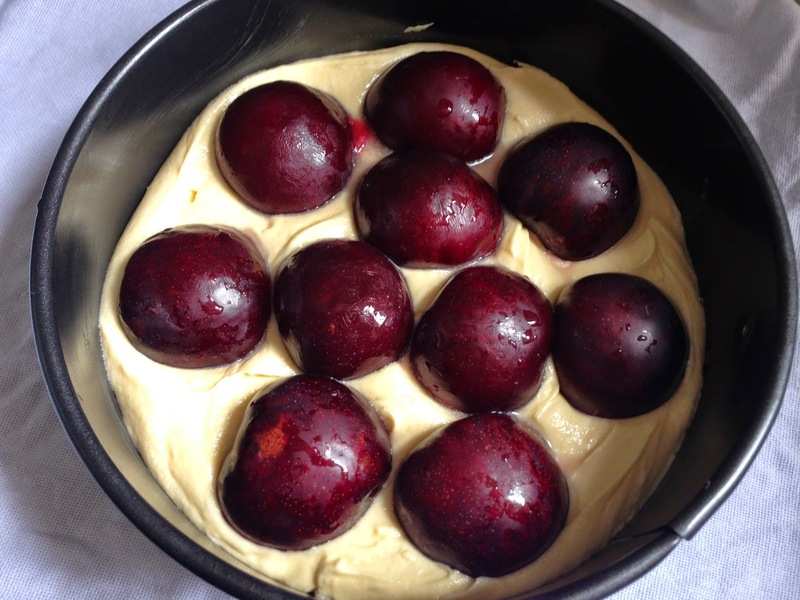 With plums looking deliciously ripe and moorish surrounded in cake batter. Um how can you not like this right? The cake batter rises up and around the plum halves, encasing them in cake. This was a HUGE hit! Tristan loved it and so did his family. Between four of us we managed to eat three quarters of the cake after dinner. Tristan then ate the remaining quarter for dessert the next night (I didn't get a look in) and said it tasted even better. Deb Perelman from Smitten Kitchen says you shouldn't even touch it on the first day you make it and leave it until the following day because it's that much better. Let's be honest... mine's not going to win any cake decorating contests but it will impress anyone who eats it. Recipe by Marian Burros from Elegant but Easy and The Essential New York Times Cookbook. - In a medium bowl sift together the flour, baking powder and salt. -In a larger bowl, cream butter and sugar together until fluffy and pale in colour. - Add the eggs, one at a time. Make sure you scrap down the side of the bowl then add the dry ingredients and mix by hand until just combined. - Spoon batter into an ungreased 9-inch spring-form pan and smooth the top using the bak of a spoon or palette knife. 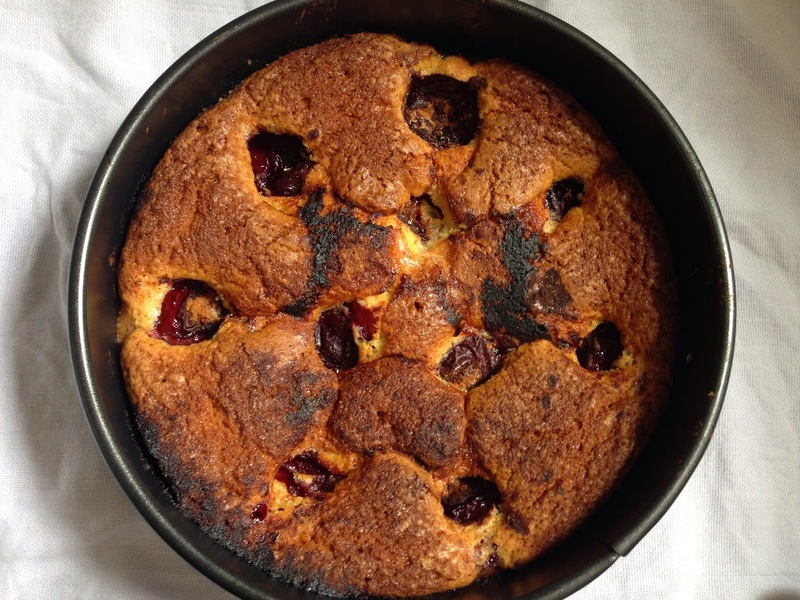 - Arrange the plums, skin side up, all over the batter. Sprinkle the top with lemon juice, cinnamon, then the remaining 1-2 tablespoons of sugar. - Bake for about 45-50 minutes or until cake is golden and a toothpick inserted and comes out with no gooey batter (make sure you don't stick it in a plum). Cool on a rack and serve. - If you have enough restraint or baked this a day early for an event. Once at room temperature, cover and leave till the next day. It gets better! Last Thursday night we had a lazy date night in that consisted of a one-pan-pasta, a huge bowl of ice cream and a movie. 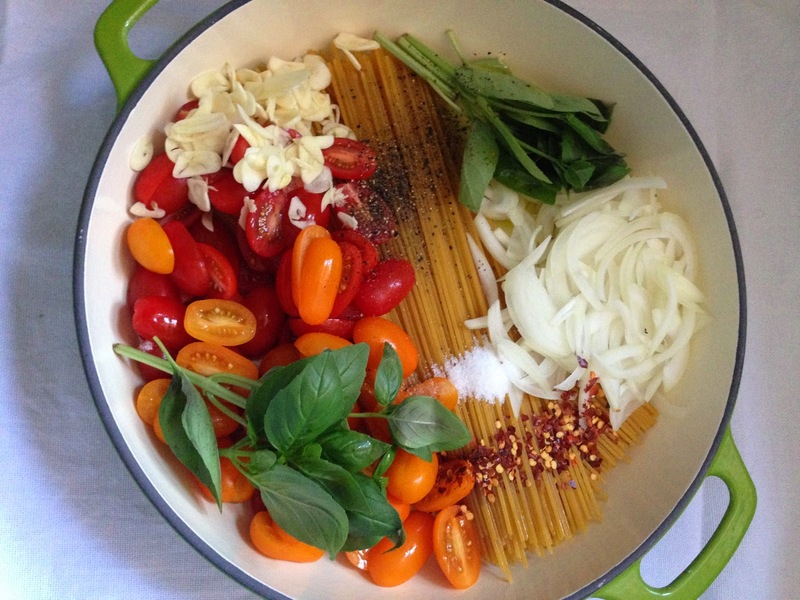 The one-pan-pasta recipe from Martha Stewart has kind of been a internet sensation if you follow a few food blogs and most blogs I read have already made this... ages ago! I'm a little late to the party but better late than never. I'd seen the recipe online about a year a go and my friend Kate, her boyfriend, Pete showed me the recipe too knowing I was a foodie but I kinda brushed it off and didn't think much of it. To be honest I was sceptical.... one-pan-pasta... just put it all in a pot together... pasta, sauce ingredients and the water. Nup! I don't believe it. Plus I also read a blog review (here) saying that the traditional way of making pasta and a sauce (the normal way) was still much better, so why would I attempt this recipe?! The big thing here: I only have to wash up one pot. This is an amazing discovery! All I keep thinking about now is what other things I can add or swap in the recipe to change the sauce up and still keep the one-pan pasta idea. I could use canned tomatoes in winter, fry some bacon up in the pan before adding all the other ingredients and or chorizo or or or... you could add anything and still only have to wash up one pan! I wonder if it'd work with short pasta... I don't see why not? ahhaha the possibilities are endless!! Ok maybe I'm a little excited about a pasta dish but to be honest I think it's a pretty funky recipe. We don't get Martha Stewart magazine here in Australia (well you can but it'll cost you an arm, leg and your first born) so not many of her recipes cross my path except through other food bloggers. I think I might have to have a ritual weekly browse of her website in case I miss another gem like this. I definitely recommend giving this a go. The sauce goes thick and rich with kind of a creamy-ness to it but not a drop of cream in sight! It also has a bit of a chilli kick so if you're not that into spice maybe half the amount of chilli flakes. I can't wait to make this again... just writing this thinking about dinner the other night and I wish I was having that for lunch... yes I had it cold the next day in a sandwich and it was GREAT! If anyone else has a food hero I'm yet to discover please let me know below. I'd love to find more hidden gems like this that I should have tried to ages ago. 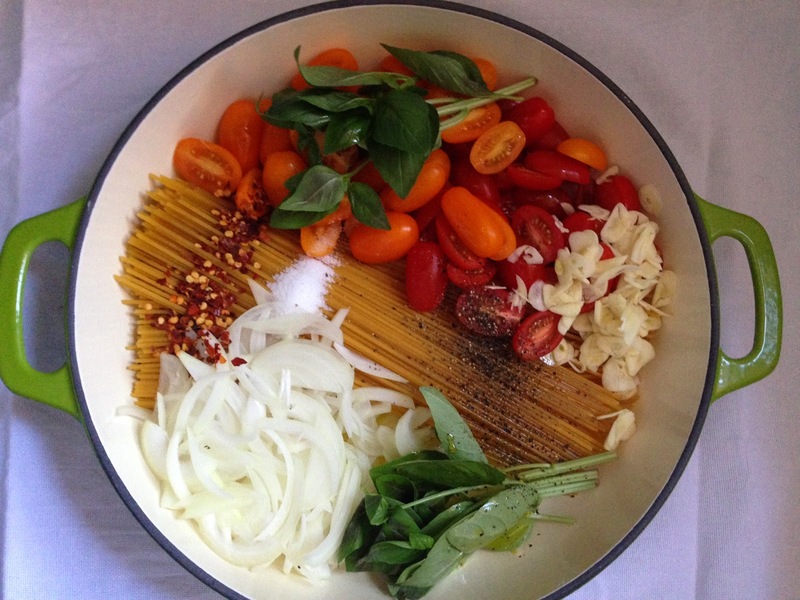 - Place pasta, tomatoes, onion, garlic, chilli flakes, basil sprigs, extra virigin olive oil, salt, pepper and the water in a pan. - Bring to a boil, this should take about 2-3 minutes. Once boiling keep stirring the pasta to separate it a little. 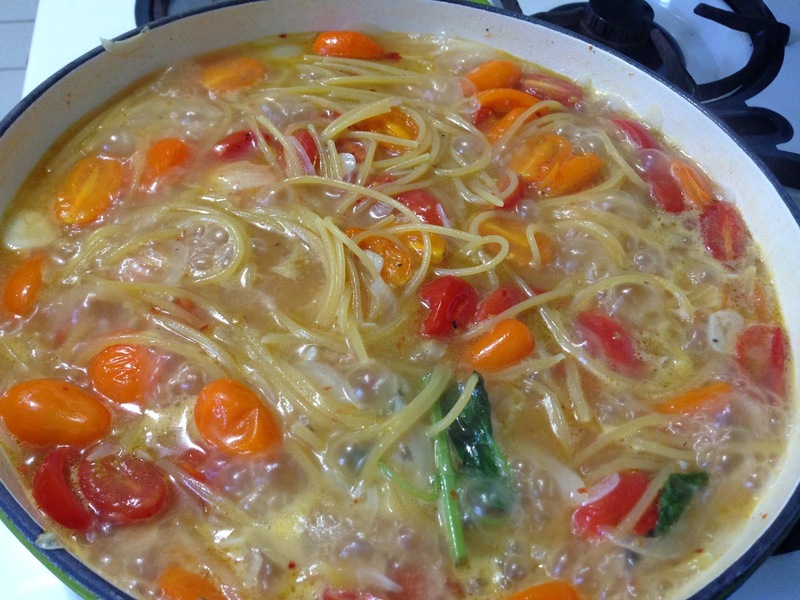 It should be done in about 9 minutes or until the pasta is cooked through and the liquid has been absorbed. 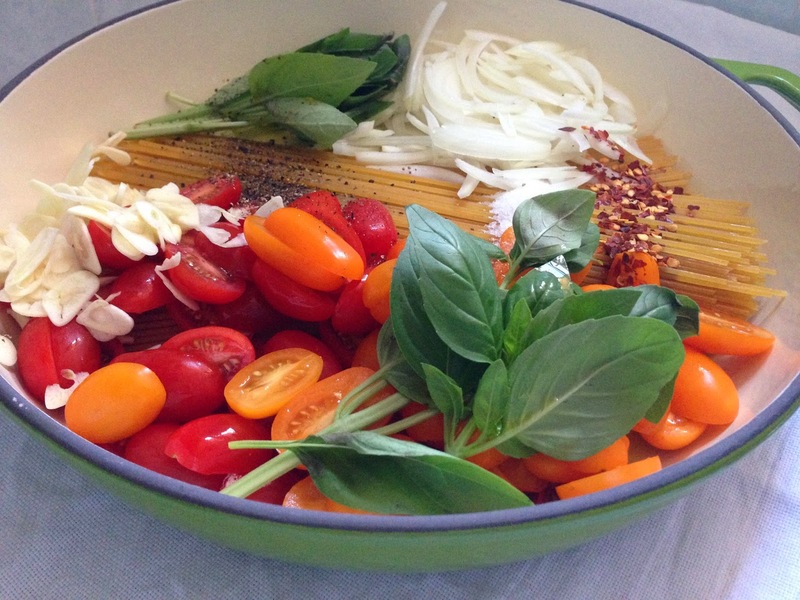 - Serve with the extra basil leaves and parmesan sprinkled on top.